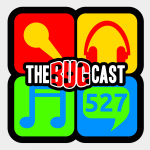 This week on The Bugcast: Caroline goes for a run, farewell to a Chuckle, we’re off to OggCamp, and we play 8 cracking tracks of Creative Commons music! OggCamp ’18 is this weekend! The next show will be episode 528, which will be streamed live in the chatroom on Friday 24 August 2018 at 21:30-ish UK time (BST/GDT/UTC+1).